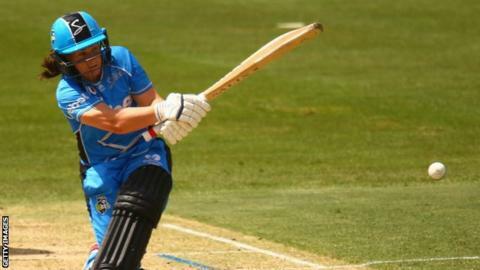 Defending champions Sydney Sixers marched into the Women's Big Bash League final with a 17-run victory over Adelaide Strikers at Adelaide Oval. Australia all-rounder Ashleigh Gardner hit six sixes in her 72 from 45 balls, anchoring the Sixers' innings of 138-5 as England's Amy Jones made only three. Seamer Sarah Aley then ripped into Adelaide, taking 4-9 while Ireland's Kim Garth picked up two early wickets. England's Tammy Beaumont top scored with 50 as the Strikers fell short. The hosts had looked vanquished at 23-6 after six overs before Beaumont's attempted rescue act, but she fell in the 17th over with 44 still needed as the Sixers - who will face Perth Scorchers in Sunday's final - held on. In the second men's semi-final, Adelaide Strikers edged out Melbourne Renegades by one run to ensure that both finals will take place at Adelaide Oval.